The Locks Heath Classic Car Club is pleased to announce that it has negotiated a deal with specialist insurance broker, Heritage Classic Car Insurance, securing discounted insurance premiums for club members. 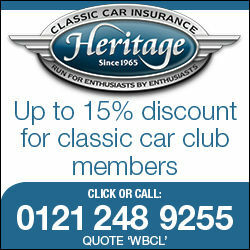 Locks Heath Classic Car Club members will receive up to 15% off Heritage’s competitive classic car insurance premiums. In return Heritage will support the club by paying a commission based on all member business. Run for the enthusiast by enthusiasts; we understand what you want from your cover. With a Heritage club members insurance policy your car can be covered whilst you take part in non competitive club organised track days on any race circuit or land prepared for such use. You won’t pay more for enjoying your clubs events, after all isn’t that why you joined your club in the first place? With a Heritage car club insurance policy your vehicle can also be automatically covered whilst you partake in club organised hill climbs, sprint or average speed road rallies – no prior referral needed. Why insure with Heritage Classic Car Insurance? Established in 1965, we like to think we know a thing or two about classic car insurance. Family owned for nearly 50 years we’re different to many of the other specialist brokers in the market. We don’t have to hike up our premiums year by year to satisfy shareholders and overly ambitious sales targets, we simply offer competitive prices, excellent levels of service and plenty of choice when it comes to the type of cover we can offer. Agreed value means the vehicle’s true value can be confirmed when you take out your insurance policy. With this option, because the value of the vehicle has already been confirmed, it doesn’t have to be negotiated or proven after an incident, taking that extra stress away. Through limited mileage policies, enthusiasts who don’t notch up a large number of miles in their classic each year can benefit from a cheaper premium. It works on the principle that the fewer miles you drive, the less your risk of an accident, therefore, the cheaper your insurance. Mileage bands are; 1,500, 3,000 or 5,000. For those lucky people who have more than one classic or just more vehicles under one roof than drivers, our multi-vehicle cover is ideal. We can cater for classics cars and bikes, everyday cars and bikes and even the occasional van. Multi-vehicle cover makes life a whole lot easier and provides better value for money than seemingly cheap one-off quotes for individual vehicles. The more vehicles the more discount. What’s more, you’ll be looked after by one dedicated account manager who will guide you through the process of adding on vehicles to your policy as each one is due for renewal. They will manage your every insurance need. One Contact, One premium and One renewal date………..now that’s refreshing! Phone line to discuss your insurance needs – 0121 248 9306.